At the heart of Brahms’s contrapuntal thinking lay the canon, whereby voices overlap with the same material which may, for example, move simultaneously at different speeds, appear in inverted form, or even be overlaid with a second, independent canon. To this day, the resulting austerity has tended to militate against the widespread popularity of the motets, even amongst the composer’s most fervent admirers. Yet, if one appreciates this music less in the light of, say, the ‘German Requiem’ or ‘Nanie’, and more in the context of its real musical ancestry—the sixteenth-century polyphonic masters of the Netherlands, the Venetian antiphonalists, and in particular Johann Sebastian Bach—these miniature masterpieces reveal their own unique world of rarefied expression. 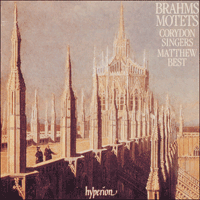 The Two Motets Op 29 are the earliest surviving works by Brahms in this particular genre. Composed in 1860, they were not published until 1864, shortly after their premiere in Vienna on 17 April, as part of a concert which also included a performance of the two-piano version of the F minor Piano Quintet, Op 34, given by Brahms and Carl Tausig. ‘Es ist das Heil uns kommen her’ is richly scored in five parts (divided basses), consisting of a chorale harmonization (cf Op 74 No 2), followed by an extended Allegro fugal setting based on the main chorale melody. Brahms alleviates the relatively conventional approach to harmony by the subtle use of a number of archetypal chromatic inflections, most potently in the final bars, intensified by their suspension over a tonic E pedal point in the bass. ‘Schaffe in mir, Gott’, also with divided basses, opens with a canon (Andante moderato) in augmentation; that is to say, whilst the sopranos sing their melody twice through, the basses simultaneously sing the identical melody but at half speed, the two parts finally meeting up at the end of the section. However, such is the resulting simplicity of musical utterance, that the casual listener would hardly be aware of this intellectual conceit. ‘Verwirf mich nicht’ (Andante espressivo) is texturally more complex, exhibiting a transcendental contrapuntal mastery. Particularly notable is the exhilarating effect caused by the canonic interplay between the sopranos and tenors just before the end of this section, sending both parts soaring up to a top A flat within a beat of each other. The following ‘Tröste mich’ (Andante) is another canon, this time overlapping horizontally at the distance of one bar, and vertically by the interval of a seventh, appearing initially between tenors and second basses. This leads directly into the final section (‘und der freudige’—Allegro) which, with its thrilling sequences of running thirds, ends the motet in a mood of resounding affirmation. Geistliches Lied Op 30 was composed in 1856, so that despite the misleading opus number it in fact predates both the ‘Ave Maria’ and the setting of Psalm 13. Published in 1864, the first performance was given in St James’s Church, Chemnitz, on 2 July 1865. Once again, the textures of this setting are predominantly canonic, with overlapping entries arriving at both the second above and the ninth below. It is the austerity of style which links this piece firmly with the motets, yet the overall mood can be seen as in some ways preparatory for the ‘German Requiem’. The final ‘Amen’, with its glorious, aching suspensions, comes as a poignant emotional release after the comparative reserve of the setting as a whole. The Three Sacred Choruses Op 37 were not published until 1865, although the first two date from 1859 (having received their first performance in Hamburg in September of that year), and the third from 1863. They represent perhaps the most austere example of Brahms’s contrapuntal mastery in this genre, all three settings being in strict canonic form. The brief F major setting of ‘O bone Jesu’ consists of a pair of simultaneous canons in contrary motion between Soprano I/Alto II and Alto I/Soprano II. In addition to the Moderato espressivo heading, the closing bars are further marked espress[ivo] by Brahms, an instruction used comparatively rarely by this most restrained of late Romantic composers, and an illustration of his obvious concern that the sheer technical ingenuity of this music should not inhibit freedom of musical interpretation. ‘Adoramus te, Christe’ is a four-part canon, with answers at the fourth, fifth, and octave below. A harmonic sleight of hand just before the final cadences deftly moves the music up a step away from an implied finish in G, to the home key of A. The structural background to ‘Regina caeli laetare’ is a canon in inversion, although the contrapuntal textures are enlivened throughout by a series of antiphonal ‘Alleluias’, clearly reflecting the influence of Giovanni Gabrieli. Composed in 1859, the year after the ‘Ave Maria’, the setting of Psalm 13 Op 27 was first performed in St Peter’s Church, Hamburg, on 19 September 1859, with Brahms himself directing. It was not published until 1864, along with a five-part string arrangement alternative to the organ accompaniment used in this recording. The setting maintains a remarkable emotional detachment until the words ‘Ich hoffe aber darauf’, where the music at last moves into a radiantly affirmative G major with an unmistakable infusion of expressive warmth. The Two Motets Op 74 were published in 1878 with a dedication to the great Bach scholar, Philipp Spitta. This is no doubt an acknowledgement of the fact that the great German master’s influence is at its most potent in these particular pieces. ‘Warum ist das Licht gegeben?’ was composed during the idyllic summer of 1877 at Pörtschach, at a time when the composer was putting the finishing touches to his Second Symphony. The first performance was given in Vienna on 8 December 1878. After a severe and imposing four-part opening section in D minor (‘Slowly and with expression’), there follows a canonic setting of ‘Lasset uns’ in six parts (divided sopranos and basses), its warm, F major glow perfectly reflecting the underlying message of the words. The following section (‘Siehe, wir’) is in two halves, the second beginning at the words ‘Die Geduld Hiob’, which developes into a repeat of the music for ‘Lasset uns’. The motet is concluded by a four-part chorale setting to the words ‘Mit Fried und Freud’. ‘O Heiland, reiss die Himmel auf’, in four parts, was composed rather earlier, between 1863 and 1864, the format and mode of expression relating it to the first of the Op 29 motets with which it is roughly contemporary. It is in strict chorale variation form, the five sections being clearly marked by Brahms as ‘Versus I’ etc. in the score. After the opening chorale setting, ‘O Gott ein Tau’ (Versus II) places the chorale melody in the soprano line whilst the supporting parts sing a three-part canon based on a rhythmically diminished version of the same theme. ‘O Erd schlag aus’ introduces a rhythmic variant in the form of a triplet, whilst ‘Versus IV’ (‘Hie leiden wir’—Adagio) is a canon by inversion, whereby the overlapping part has the same melody, but with all the intervals turned upside down. ‘Da wollen’ continues this trend with a double canon (i.e. two canons sounded simultaneously) in inversion, the altos/tenors and sopranos/basses being paired. The final ‘Amen’ demonstrates the ‘stretto’ effect, whereby the various overlapping entries appear ever closer to one another, creating a superb final peroration. Composed in 1858, but not published until 1861, the first performance of the Ave Maria Op 12 was given at the Gradener Akademie in Hamburg on 2 December 1859, with orchestral accompaniment (the optional organ version is used here), along with the Funeral Hymn Op 13, both directed by Brahms. It represents the composer’s first published attempt at combining vocal and instrumental music, and although there are certain infelicities, the obvious warmth of expression contrasts markedly with the main body of the motets as a whole. The score of Fest- und Gedenksprüche Op 109 (Festival and Commemoration Sentences) is inscribed: ‘Seiner Magnifizenz dem Herrn Bürgermeister Dr. Carl Petersen in Hamburg verehrungsvoll zugeeignet’, on the occasion of Brahms being at last made a Freeman of the City of Hamburg. Composed between 1888 and 1889, they received their first performance in Hamburg on 9 September 1889, and were published the following year. Despite their specific intention, Brahms regarded these memorial verses rather as general pieces for national days of commemoration, and perhaps this is why they are stylistically less cerebral than the mainstream motets, which these pieces are in all but name. The stylistic impetus was the late sixteenth-century Venetian school, rather than the intricacies of Bachian textural density and contrapuntal conceit. The opening of ‘Unsere Väter hofften auf dich’ (F major, 3/4) immediately establishes the antiphonal nature of all three settings, the basic musical material being announced each time by the second choir and then embellished by the first, overlapping at the distance of one bar. The concluding section (‘Der Herr wird seinem Volk’) moves into quadruple time, opening with the male voices of both choirs, and developing into a culminatory passage of free, eight-part counterpoint. ‘Wenn ein starker Gewappneter’ is structurally the simplest of the three, being cast in a clearly identifiable ABA form, whereby the Handelian opening music returns once more at the end. The C minor middle section is highly dramatic, including a biting setting of ‘ein Haus fället’. The Venetian style is at its most potent in ‘Wo ist ein so herrlich Volk’, with its imposing antiphonal terracing. The closing bars show Brahms’s inspiration running at white heat, being a poignant reminder of the opening music in the form of a series of moving suspensions held over a low, tonic pedal point. Au cœur même de la conception du contrepoint de Brahms se trouve le canon, grâce auquel les voix se chevauchent avec le même matériau qui peut, par exemple, progresser simultanément à différentes vitesses, apparaître sous forme renversée, ou même être couvert par un second canon indépendant. Il en résulte une austérité qui a tendu, jusqu’à nos jours, à mitiger la grande popularité des motets, même parmi les plus fervents admirateurs du compositeur. Cependant si l’on apprécie cette musique moins en relation avec, par exemple, le «Requiem allemand» ou «Nanie», et davantage dans le contexte de sa véritable ascendance musicale—les maîtres polyphoniques des Pays-Bas du seizième siècle, les maîtres antiphoniques vénitiens, et en particulier Jean-Sébastien Bach—ces chefs d’œuvre en miniature révèlent leur univers unique avec son extrême raffinement d’expression. Les Deux motets op. 29 sont les premières du genre à avoir survécu parmi les œuvres de Brahms. Composés en 1860, ils ne furent publiés qu’en 1864. «Es ist das Heil uns kommen her» est somptueusement composé en cinq parties (basses divisées) et consiste en une harmonisation chorale (voir op. 74 no 2) suivi par une mise en musique fugale prolongée Allegro dont la base est la principale mélodie chorale. Brahms adoucit l’approche relativement conventionnelle à l’harmonie par une subtile utilisation d’un certain nombre d’altérations chromatiques archétypes. Cela est illustré le plus fortement dans les mesures finales qui sont intensifiées par leur suspension au-dessus d’un son soutenu de pédale de mi tonique dans la basse. «Schaffe in mir, Gott», qui est aussi composé avec des basses divisées, débute par un canon (Andante moderato) en augmentation; c’est-à-dire que pendant que les sopranos chantent deux fois leur mélodie en entier, les basses chantent simultanément l’identique mélodie à une vitesse réduite de moitié, et les deux parties se rejoignent finalement à la fin de la section. «Verwirf mich nicht» (Andante espressivo) est de texture plus complexe et fait preuve d’une maîtrise transcendantale du contrepoint. Il faut noter en particulier l’effet stimulant produit par le jeu canonique entre les sopranos et les ténors, juste avant la fin de cette section, qui semble lancer les deux parties en flèche vers un la bémol aigu qu’elles atteignent à moins d’un battement de mesure l’une de l’autre. Le verset suivant, «Tröste mich» (Andante) est un autre canon, cette fois-ci se chevauchant horizontalement avec une mesure de distance et verticalement avec un intervalle d’une septième; son apparence initiale est entre les ténors et les secondes basses. Ceci mène directement dans la section finale («und der freudige»—Allegro) qui termine le motet dans un mode d’affirmation retentissante, avec ses séquences saisissantes de tierces tombantes. Geistliches Lied op. 30 fut composé en 1856. En dépit du numéro d’opus qui induit en erreur, il date en fait d’avant l’«Ave Maria» et la mise en musique du Psaume 13. Il fut représenté pour la première fois dans l’église de Saint Jacques à Chemnitz, le 2 juillet 1865. Là encore, nous trouvons les textures de cette mise en musique de prédominance canonique, avec des entrées imbriquées arrivant à la fois à la seconde supérieure et la neuvième inférieure. Ce qui apparente fermement cette œuvre avec les motets, c’est l’austérité du style, et cependant le mode général peut être considéré en quelque sorte comme une préparation au «Requiem allemand». L’Amen final, avec ses glorieuses suspensions douloureuses, arrive comme une poignante libération d’émotion après la relative réserve de l’ensemble de cette mise en musique. Les Trois chœurs sacrés op. 37 ne furent pas publiés avant 1865, bien que les deux premiers datent de 1859 et furent représentés pour la première fois à Hambourg en septembre de cette année-là. Le troisième date de 1863. Ces chœurs sont sans doute l’exemple le plus austère de la maîtrise contrapuntique de Brahms dans ce genre; les trois mises en musique sont strictement en forme de canon. La courte mise en musique en fa majeur de «O bone Jesu» consiste en deux canons simultanés en mouvement contraire entre Soprano I/Alto II et Alto I/Soprano II. Au titre Moderato espressivo Brahms a ajouté de surcroît pour les mesures finales une indication supplémentaire espress[ivo], instruction que ce compositeur, le plus sobre de la fin du Romantisme, utilisait rarement. «Adoramus te, Christe» est un canon à quatre parties, avec réponses en quarte, quinte et octave inférieurs. Par un tour de prestidigitation harmonique, juste avant les cadences finales, la musique s’éloigne adroitement d’une fin implicite en sol pour rejoindre le ton de la. La structure de base de «Regina caeli laetare» est un canon en inversion bien que les textures en contrepoint soient animées tout au long par une série d’alléluias antiphoniques, qui révèlent manifestement l’influence de Giovanni Gabrieli. La mise en musique du Psaume 13 op. 27 fut composée en 1859, un an après l’«Ave Maria», et elle fut interprétée pour la première fois dans l’église de Saint Pierre, à Hambourg, le 19 septembre 1859, sous la direction de Brahms lui-même. Elle ne fut publiée qu’en 1864, avec un arrangement en cinq parties pour cordes comme alternative pour l’accompagnement pour orgue utilisé dans cet enregistrement. La musique maintient un détachement émotionnel remarquable jusqu’aux paroles «Ich hoffe aber darauf», quand la musique s’engage enfin dans une radiante affirmation en sol majeur, infusée d’une chaleur d’expression qui ne peut tromper. Les Deux motets op. 74 furent publiés en 1878, avec une dédicace à Philipp Spitta, le grand spécialiste de Bach. «Warum ist das Licht gegeben?» fut composé durant l’idyllique été de 1877, à Pörtschach, à une époque où le compositeur terminait sa seconde symphonie. Ce motet fut interprété pour la première fois à Vienne le 8 décembre 1878. Après une sévère et imposante section initiale en ré mineur («Lentement et avec expression») vient une mise en musique canonique de «Lasset uns» en six parties (sopranos et basses divisés); sa chaude ardeur en fa majeur reflète parfaitement le message sous-entendu des paroles. La section suivante («Siehe, wir») est en deux parties, la seconde débutant avec les mots «Die Geduld Hiob» devient une répétition de la musique de «Lasset uns». Le motet se termine sur une mise en musique chorale à quatre parties des paroles «Mit Fried und Freud». «O Heiland, reiss die Himmel auf» en quatre parties fut composé un peu plus tôt, entre 1863–64; le format et l’expression s’apparentent au premier des motets de l’opus 29 dont il est presque contemporain. Sa forme est une stricte variation chorale, et les cinq sections sont marquées clairement par Brahms «Versus I», etc. dans la partition. Après la mise en musique chorale d’ouverture, le second verset «O Gott ein Tau» place la mélodie chorale dans le registre soprano pendant que les parties secondaires chantent un canon à trois parties basé sur une version rythmiquement diminuée du même thème. Le troisième verset «O Erd schlag aus» introduit une variante rythmique sous la forme d’un triolet, pendant que le quatrième verset («Hie leiden wir»—Adagio) est un canon par inversion où la partie chevauchante a la même mélodie, mais avec tous les intervalles renversés. Le cinquième verset «Da wollen» continue cette tendance au double canon (c’est-à-dire deux canons entendus simultanément) en inversion, avec les altos/ténors et les sopranos/basses arrangés en paires. L’Amen final démontre l’effet de «strette», selon lequel les différentes entrées imbriquées paraissent encore plus proches l’une de l’autre, ce qui crée une péroraison finale magnifique. L’Ave Maria op. 12 fut composé en 1858, mais ne fut publié qu’en 1861. Sa première représentation fut donnée à la Gradener Akademie de Hambourg, le 2 décembre 1859, avec un accompagnement orchestral (la version facultative avec orgue est utilisée dans cet enregistrement), en même temps que l’«Hymne funèbre» op. 13, sous la direction de Brahms lui-même. Cette œuvre représente le premier essai par le compositeur de combiner la musique vocale et la musique instrumentale et malgré certaines maladresses, la chaleur évidente de l’expression est en contraste marqué avec l’ensemble tout entier des motets. La partition de Fest- und Gedenksprüche op. 109 porte l’inscription: «Seiner Magnifizenz dem Herrn Bürgermeister Dr. Carl Petersen in Hamburg verehrungsvoll zugeeignet», et était destinée à célébrer le fait que Brahms avait enfin été nommé citoyen d’honneur de la Cité d’Hambourg. Composée entre 1888 et 1889, elle fut interprétée pour la première fois à Hambourg le 9 septembre 1889, et fut publiée l’année suivante. En dépit de leur intention précise, Brahms considérait ces vers commémoratifs plutôt comme des œuvres généralement destinées à des journées de mémorial national; c’est peut-être la raison pour laquelle elles sont d’un style moins cérébral, plus sobres que les motets traditionnels dont elles ont la forme sinon le nom. Elles doivent leur style à l’école vénitienne de la fin du seizième siècle plutôt qu’aux complexités de densité de texture et brillance contrapuntique de Bach. Dès l’ouverture de «Unsere Väter hofften auf dich» (fa majeur, 3/4) la nature antiphonique de ces trois mises en musique est établie. Le matériau musical de base est annoncé chaque fois par le second chœur, puis est embelli par le premier, se chevauchant à une mesure de distance. La section finale «Der Herr wird seinem Volk» change en mesure quadruple, avec une ouverture avec les voix d’hommes des deux chœurs qui se développe en un passage de contrepoint libre à huit parties. La structure de «Wenn ein starker Gewappneter» est la plus simple des trois pièces, écrite sous une forme facile à identifier ABA, selon laquelle la musique Handelienne initiale réapparaît encore à la fin. La section centrale en ut mineur est très dramatique, et comprend une mise en musique mordante de «ein Haus fället» («une maison s’écroule»). Dans «Wo ist ein so herrlich Volk», le style vénitien se fait sentir de la manière la plus forte, avec ses imposants arrangements antiphoniques en terrasses. Les mesures finales démontrent l’inspiration incandescente de Brahms, en rappelant de façon poignante la musique d’ouverture sous la forme d’une série de suspensions tenues au-dessus d’un son de pédale bas, longuement soutenu. Unter den Komponisten des späten 19. Jahrhunderts gab es keinen, der Brahms als Kontrapunktiker ebenbürtig gewesen wäre, und nirgends lassen sich seine Meisterschaft sowie sein Einfühlungsvermögen besser aufzeigen als an den unbegleiteten Motetten. So groß sind die strukturelle Dichte und das technische Raffinement eines erheblichen Teils seiner Musik, daß Brahms einmal besorgt bei seinem Freund und Mentor Joseph Joachim anfragte, ob sie, von ihrer Kunstfertigkeit einmal abgesehen, denn auch gut sei. Im Mittelpunkt von Brahms’ kontrapunktischem Denken stand der Kanon, also überlappende, gleich geführte Stimmen, die zum Beispiel simultan, aber in unterschiedlichem Tempo voranschreiten, die in invertierter Form erscheinen oder gar von einem zweiten, unabhängigen Kanon überlagert werden. Bis auf den heutigen Tag ist die resultierende schmucklose Musik einer allseitigen Popularität der Motetten eher abträglich, selbst bei den glühendsten Verehrern des Komponisten. Betrachtet man sie jedoch weniger im Lichte des „Deutschen Requiems“ oder der „Nänie“ und mehr im Kontext ihrer tatsächlichen musikalischen Vorväter—der Meister der Polyphonie, die im 16. Jahrhundert in den Niederlanden tätig waren, der venezianischen Antiphoniker und insbesondere Johann Sebastian Bachs—offenbaren diese meisterlichen Miniaturen ihre ureigene verfeinerte Ausdruckswelt. Die Zwei Motetten op. 29 sind die frühesten von Brahms erhaltenen Werke dieses Genres. Obwohl bereits 1860 komponiert, wurden sie erst 1864 veröffentlicht. „Es ist das Heil uns kommen her“ ist fünfstimmig (mit unterteilten Bässen) ausgeführt und besteht aus einer Choralvertonung (vergl. op. 74 Nr. 2), gefolgt von einem erweiterten, mit Allegro bezeichneten Fugensatz auf der Grundlage der Hauptchoralmelodie. Brahms gleicht sein relativ konventionelles Herangehen an die Harmonik durch feinsinnigen Einsatz einer Reihe von archetypischen chromatischen Nuancen aus, am eindringlichsten in den Schlußtakten, die durch ihren Vorhalt über einem Orgelpunkt der Tonika E im Baß intensiviert werden. „Schaffe in mir, Gott“, bei dem ebenfalls die Bässe aufgeteilt sind, setzt mit einem Augmentationskanon (Andante moderato) ein; das ist so zu verstehen, daß die Soprane ihre Melodie zweimal durchsingen, während die Bässe simultan die gleiche Melodie singen, jedoch mit halber Geschwindigkeit, bis beide Stimmen am Ende des Abschnitts zusammentreffen. „Verwirf mich nicht“ (Andante espressivo) ist vom Aufbau her komplexer und läßt erhabene kontrapunktische Meisterschaft erkennen. Besonders bemerkenswert ist der belebende Effekt, den das kanonische Wechselspiel zwischen Sopranen und Tenören kurz vor dem Ende dieses Abschnitts auslöst, der beide Stimmen veranlaßt, sich im Abstand von nur einem Taktschlag zu einem hohen As emporzuschwingen. Das nachfolgende „Tröste mich“ (Andante) ist wiederum ein Kanon, der diesmal horizontal im Abstand von einem Takt überlappt, vertikal um eine Septime versetzt ist und zunächst zwischen Tenor und zweiter Baßstimme in Erscheinung tritt. Daran schließt sich unmittelbar der Schlußteil an („und der freudige“—Allegro), der mit seinen begeisternden Folgen abfallender Terzen die Motette in einer Atmosphäre widerhallender Bekräftigung ausklingen läßt. Das Geistliches Lied op. 30 wurde 1856 komponiert, ist also trotz der irreführenden Werksnummer nicht nur älter als das „Ave Maria“, sondern auch älter als die Vertonung des 13. Psalms. Es wurde 1864 veröffentlicht, und die Uraufführung fand am 2. Juli 1865 in der Chemnitzer Jakobskirche statt. Auch diese Vertonung ist in der Hauptsache kanonisch aufgebaut, mit überlappenden Einsätzen, die sowohl eine Sekunde nach oben, als auch eine None nach unten versetzt erfolgen. Es ist seine stilistische Strenge, die dieses Stück unverrückbar mit den Motetten verknüpft, während seine Grundstimmung in gewisser Hinsicht als Vorbereitung auf das „Deutsches Requiem“ gesehen werden kann. Das „Amen“ mit seinen herrlich schmerzlichen Vorhalten wirkt zum Abschluß der insgesamt vergleichsweise zurückhaltenden Vertonung als ergreifende emotionale Erlösung. Die Drei Geistlichen Chöre op. 37 wurden 1865 veröffentlicht, obwohl die ersten beiden schon 1859 entstanden (uraufgeführt im September des Jahres in Hamburg), und der dritte 1863. Sie sind wohl als strengste Beispiele für Brahms’ kontrapunktische Meisterschaft in diesem Genre anzusehen; alle drei sind in strikter kanonischer Form ausgeführt. Die kurze Vertonung von „O bone Jesu“ in F-Dur besteht aus zwei simultanen, aber gegenläufigen Kanons zwischen Sopran I/Alt II und Alt I/Sopran II. Zusätzlich zu der Überschrift Moderato espressivo wurden die Schlußtakte von Brahms mit der Anmerkung espress[ivo] versehen, eine Vorschrift, mit der dieser zurückhaltendste aller spätromantischen Komponisten relativ sparsam umging. Das „Adoramus te, Christe“ ist ein vierstimmiger Kanon mit nachfolgenden Einsätzen in der darunterliegenden Quarte, Quinte und Oktave. Ein harmonischer Kunstgriff kurz vor den Schlußkadenzen rückt die Musik gewandt um eine Tonstufe herauf, also einen Schritt weg vom implizierten Ausklang in G-Dur zurück in die Grundtonart A-Dur. Die Struktur von „Regina caeli laetare“ baut auf einem Inversionskanon auf. Allerdings wird das kontrapunktische Gefüge durchweg belebt durch eine Reihe antiphoner „Allelujas“, die deutlich den Einfluß von Giovanni Gabrieli erkennen lassen. Die Vertonung des 13. Psalms op. 27 entstand 1859, im Jahr nach dem „Ave Maria“, und wurde am 19. September des Jahres mit Brahms am Dirigentenpult in der Hamburger Peterskirche uraufgeführt. Doch wurde sie erst 1864 zusammen mit einem fünfstimmigen Streicherarrangement als Alternative zu der für diese Aufnahme benutzten Orgelbegleitung veröffentlicht. Die ganze Vertonung zeichnet sich durch eine bemerkenswerte emotionale Distanziertheit aus, bis die Worte „Ich hoffe aber darauf“ erklingen. Dann endlich geht die Musik mit einer unverkennbaren Beimischung expressiver Wärme zu strahlend affirmativem G-Dur über. Die Zwei Motetten op. 74 wurden 1878 mit einer Widmung an den bedeutenden Bachgelehrten Philipp Spitta veröffentlicht. „Warum ist das Licht gegeben?“ wurde während des idyllischen Sommers 1877 in Pörtschach komponiert, zu einer Zeit, als Brahms gerade letzte Hand an seine 2. Sinfonie legte. Die Uraufführung fand am 8. Dezember 1878 in Wien statt. Auf die strenge, imposante vierstimmige Eröffnung in d-Moll („Langsam und ausdrucksvoll“) folgt eine kanonische Vertonung von „Lasset uns“ für sechs Stimmen (mit aufgeteilten Sopranen und Bässen), deren warmer Glanz in F-Dur perfekt die den Worten innewohnende Botschaft widerspiegelt. Der anschließende Teil („Siehe, wir“) besteht aus zwei Hälften, deren zweite mit den Worten „Die Geduld Hiob“ anfängt und sich zu einer Wiederholung der Musik von „Lasset uns“ entfaltet. Den Schluß der Motette bildet ein vierstimmiger Choral auf die Worte „Mit Fried und Freud“. Das vierstimmige „O Heiland, reiss die Himmel auf“ entstand recht früh, nämlich um 1863/64, und sowohl das Format als auch die Art seines Ausdrucks sind der ungefähr um die gleiche Zeit entstandenen ersten Motette op. 29 verwandt. Von der Form her handelt es sich um einen Satz strenger Choralvariationen, dessen fünf Abschnitte von Brahms in der Partitur eindeutig als „Versus I“ etc. gekennzeichnet wurden. Nach der einleitenden Choralvertonung weist „O Gott ein Tau“ (Versus II) die Choralmelodie dem Sopran zu, während die Begleitstimmen einen dreistimmigen Kanon singen, der auf einer rhythmisch gestrafften Version des gleichen Themas beruht. „O Erd schlag aus“ führt als rhythmische Variante Triolen ein, und Versus IV („Hie leiden wir“—Adagio) ist ein invertierter Kanon, dessen überlappende Stimme die gleiche Melodie, jedoch mit umgekehrten Intervallen aufweist. „Da wollen wir“ setzt diese Tendenz mit einem invertierten Doppelkanon (d.h. zwei gleichzeitig vorgetragenen Kanons) in der Paarung Alt/Tenor und Sopran/ Baß fort. Das abschließende „Amen“ ist ein Beispiel für den „Stretto“-Effekt, bei dem die gestaffelten Einsätze immer dichter aufeinanderzufolgen scheinen, so daß ein herrlicher Abschluß entsteht. Die Uraufführung des 1858 komponierten, aber erst 1861 veröffentlichten Ave Maria op. 12 fand am 2. Dezember 1859 in der Gradener Akademie in Hamburg statt, und zwar mit Orchesterbegleitung (hier wurde die fakultative Orgelversion benutzt). Das Programm sah außerdem den Begräbnisgesang op. 13 vor, und beide Werke wurden von Brahms persönlich dirigiert. Das „Ave Maria“ stellt den letzten veröffentlichten Versuch des Komponisten dar, Vokal- und Instrumentalmusik zu verknüpfen, und obwohl es gewisse Ungeschicklichkeiten aufweist, kontrastiert doch die nicht zu übersehende Wärme seines Ausdrucks deutlich mit den Motetten in ihrer Gesamtheit. Die Partitur der Fest- und Gedenksprüche op. 109 trägt die Aufschrift: „Seiner Magnifizenz dem Herrn Bürgermeister Dr. Carl Petersen in Hamburg verehrungsvoll zugeeignet.“ Anlaß hierfür war die Ernennung von Brahms zum Ehrenbürger der Stadt Hamburg. Sie wurden zwischen 1888 und 1889 komponiert, am 9. September 1889 in Hamburg uraufgeführt und im folgenden Jahr veröffentlicht. Trotz ihrer eindeutigen Zweckbestimmung war Brahms von der Verwendbarkeit der „Fest- und Gedenksprüche“ als allgemeine Musikstücke für nationale Gedenktage überzeugt, was vermutlich der Grund dafür ist, daß sie stilistisch weniger kopflastig und emotional reserviert sind als die Mehrzahl der Motetten, denn um Motetten handelt es sich auch hier, außer dem Namen nach. Den stilistischen Impetus lieferte eher die venezianische Schule des späten 16. Jahrhunderts als Bach und die ihm eigenen Feinheiten struktureller Dichte und kontrapunktischer Finesse. Die Eröffnung von „Unsere Väter hofften auf dich“ (F-Dur, 3/4-Takt) etabliert sogleich den antiphonen Charakter aller drei Vertonungen, deren musikalisches Grundmaterial jedesmal durch den zweiten Chor angekündigt und dann um einen Takt versetzt vom ersten ausgeführt wird. Der letzte Abschnitt („Der Herr wird seinem Volk“) geht zum 44-Takt über. Er fängt mit den Männerstimmen beider Chöre an und entfaltet sich zu einer kumulativen Darbietung freien achtstimmigen Kontrapunkts. „Wenn ein starker Gewappneter“ ist vom Aufbau her das schlichteste der drei Stücke. Es hat eine eindeutige ABA-Form, die daran zu erkennen ist, daß die an Händel erinnernde Musik der Einleitung am Ende wiederkehrt. Der Mittelteil in c-Moll ist hochdramatisch, mit einer schneidenden Vertonung der Worte „ein Haus fället“. Der venezianische Stil macht sich am deutlichsten bemerkbar in „Wo ist ein so herrlich Volk“ mit seiner eindrucksvollen antiphonen Staffelung. Die Schlußtakte zeigen Brahms’ Inspiration in voller Blüte. Sie dienen als ergreifende Erinnerung an die Musik der Eröffnung und nehmen die Gestalt einer Serie bewegender Vorhalte über einem tiefen Orgelpunkt in der Tonika an.